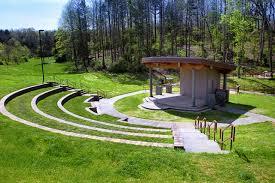 The amphitheater at Punderson State Park is used for Saturday night movies at the campground, and could be used to have wildlife and other presentations at the park. However, there has been discussion over past years about giving it an upgrade. Above are some of the issues we currently face in looking into this project. Most people we hear from complain about the seating. The benches have no backs and because they are on a slope, lean slightly forward, making sitting uncomfortable. Next, although there is a path to the amphitheater from the Nature Center area, there is no direct path from the parking lot next to the campground check-in station. Neither path is what we would consider handicap, stroller or wagon accessible and this is something we think the amphitheater should be. Although the screen and stage are in decent shape, they need a little maintenance each year. Our main focus would be on creating a low maintenance amphitheater seating area for all to enjoy. One idea would be to create a solid base area for wheel chairs and strollers, as well as paths from parking areas, with tiered levels going up from there (as seen in picture to the left). The levels could be simple, with or without benches (so people can bring and use their own comfortable camping chairs or a blanket to lay on). Another plan we have thought of was installing grounded benches with backs, however this has proven to be more costly. Regardless, it is going to take a lot of hard work and more funding to get this project accomplished.